PAPA ROBBIE.NET: Gregory Isaacs: "The Cool Ruler"
Born in Fletchers land Kingston Jamaica on the 15th July 1950, Gregory Anthony Isaacs was the first son of Lester Isaacs and Enid Murrary. Gregory started out as an electrician and cabinet maker. His career in music remained his ambition. He was inspired by singers such as Sam Cooke, Percy Sledge, Delroy Wilson, Alton Ellis and Ken Boothe. Gregory began his recording career in the late sixties with "Another Heartache" for singer/producer Winston Sinclair. Although the record was not successful he was not discouraged and in 1969 he formed a group called The Concords with Penro Bramwell. They recorded a few 45s "Buttoo", "I Need Your Loving" and "Don't Let Me Suffer" for producer Rupie Edwards. 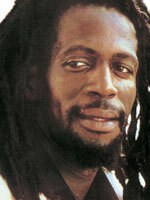 Success did not follow so Gregory Isaacs decided to move on his career as a solo artist. He went on to record for Prince Buster entitled "Dancing Floor". Still not content he decided to start his own label, assisted by his friend Errol Dunkley, around 1973 and that was the beginning of the legendary African Museum record label, until this day producing classics. in 1974 Gregory recorded "Love Is Overdue" for Alvin "GG" Ranglin at Duke Reid's Treasure Isle Studio which was a major success. In 1975 he sold over 42,000 copies of the album "In Person". Gregory continued to record for a number of producers as well as maintaining his own African Museum label. He produced Mr. Isaacs in 1976-77 and "Extra Classic" in 1977. In the following year he signed a deal with Virgin and recorded two albums for their "Frontline" label, "Cool Ruler" in 1978 and "Soon Forward" in 1979. When his contract wih Virgin expired, UK-based label Charisma wasted no time in signing him up. For this record company he produced the classic albums "Lonely Lover" in 1980 and "More Gregory" in 1980. In 1982 Island Records made an undiclosed offer that Gregory Isaacs could not refuse. Gregory opted for a short term contract. He then demonstrated his unique talent and produced the album "Night Nurse", which was a huge international success. In 1984 by mutual agreement he left Island Records and recorded for a friend and producer Tads "Green Back" Dawkins and produced two fine albums, "Easy" around September 1984 and "All I Have Is Love, Love, Love" in May 1986. In those mid-eighties he was beset by personal and legal problems and was even jailed in Kingston's General Penitentiary. After being released from prison he served his fans with a new album entitled "Out Deh". Due to these problems - including financial problems - Gregory was willing to record for anyone and everyone who was prepared to pay him. In the second half of the eighties he was the most high prolific reggae artist recording for produces like King Jammy, Bobby Digital, Steely & Clevie, Redman, Sly & Robbie, Gussie Clarke, King Tubby, among others. Despite rumours about Gregory Isaacs' rude boy lifestyle and the near destruction of his unique talents with the help of cocaine he is still recording and still creating hit tracks to this day. With a musical career spans over three decades by now and having delivered a trailer load of reggae classics - singles as well as albums - his legendary status and reputation in the reggae business are truly second to none.